Or was it? I have a faint memory of a station wagon with some kind of plastic luggage-shaped mass on the roof, but this “Sherrif Patrol” is the one I always think of. And man, I have not seen this thing in years! It’s missing some of that cool sparkle blue paint, and the metal grille and underbody have gone dull too. It has spent many play-hours both inside and outside, and it shows. I’ve never been much of a collector, but the internet never fails to amaze me with all the things that have been carefully cataloged. 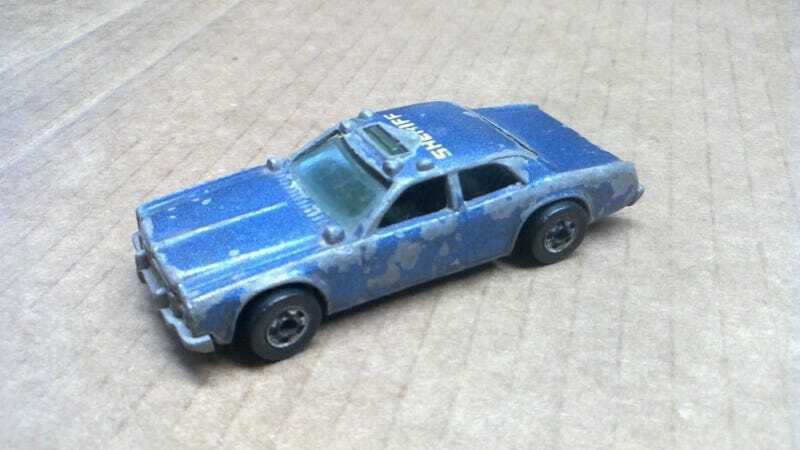 Thanks to the Hot Wheels Wiki, I can now recognize it as a 1977-78 Dodge Monaco. Never knew that. I just grew up thinking of this as a generic cop car. Did it really look like this? It’s been so long, I can’t say I remember there being white on the doors and roof. But the Wiki doesn’t list an all-blue variant, so I guess the white bits must have been applied over the blue base and long-since worn away.